The Sony BCT-D6 Digital Betacam Video Cassette is a 1/2" metal tape made for Digital Betacam equipment. It brings out the full potential of 1/2" digital ENG/EFP, post production and transmission, in terms of high output, durability, and long-term archive capability. The superb multi-generation recording characteristics of this tape and compatible recorders have led to the format becoming the de-facto global mastering format in standard definition digital production. The tape is supplied in a plastic album case. This digital Betacam video cassette has six minutes of recording time. 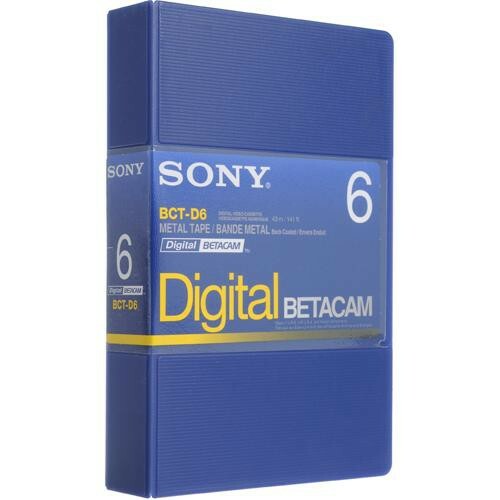 BCT-D6 Six Minute Digital Betacam Cassette is rated 4.0 out of 5 by 1.